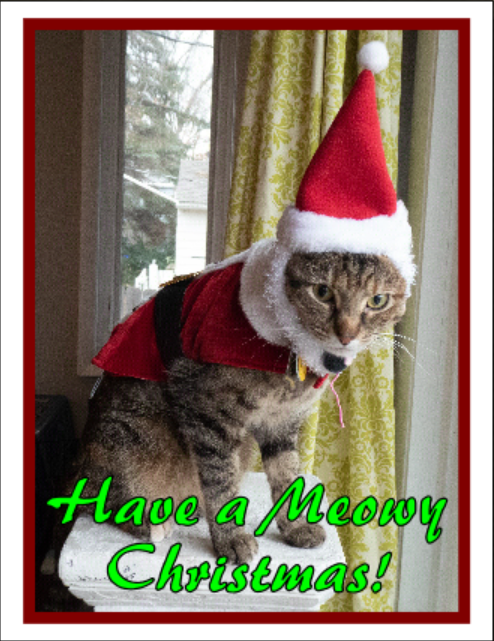 My cat Rainy and I are having fun this December making personalized Christmas cards. Instagram is to blame for my decision to make personalized Christmas cards. While scrolling through photos of Rainy’s followers, I noticed how many of their adventure cats were wearing sweaters. Then I started thinking about how much I bundle up just to drive Rainy to a therapy visit in December, and how unprotected she is by comparison. Yes, she’s covered in fur, but as an indoor cat she’s not used to frigid winter weather. Of course, before I fork out money on a sweater, I wanted to know that she’d wear it, and so I tried one of Barnaby’s sweaters on her. She reacted to it with as much interest as her harness, or in other words she barely gave it notice. I snapped a photo and then proceeded to try Barnaby’s other outfits on her, including a Santa suit. I thought nothing more about our fashion show until I noticed that a few Instagram followers were exchanging Christmas cards. Suddenly I had the perfect use for all those photos I’d taken of Rainy in Barnaby’s outfits! Scrapbook Factory has long been my favorite software for creating designs. The front of the card was easy enough. I simply imported my photo of Rainy posing in a Santa suit. To add extra elegance, I added a complementary dark purple border and wrote “Have a Meowy Christmas!” in holly green text. Surprisingly, given that I’m a writer, the inside proved to be a struggle. I felt insecure designing a card for people who had been exchanging cards for years. In addition, I felt awkward about writing to people whom I didn’t really know except through photos of their cats. Then Andy showed me a card his friend had made, and seeing her example boosted my confidence. I realized that I just needed to pick one thing we had in common and write about it. For my first card, I wrote about snow, because I know that the recipient already has plenty of it in Canada. Once I had the inside designed, I decided to play around with the back. 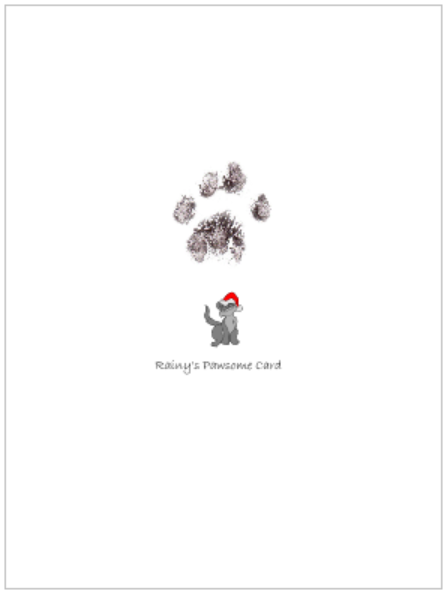 I pasted a cute graphic of a cat in a Christmas hat and wrote Rainy’s Pawsome Card. I also finally made use of the pet-safe ink that I had bought earlier this fall to create some paw signatures. I discovered that as long as a cat is used to have its nails clipped, inking its paws isn’t difficult. I started with the victim – er, cat – that I thought would be the most cooperative, Rainy, and learned from her the best steps to take. Wear old clothes. Even the most tolerate cat is likely to squirm and imprint your clothes with her inky paws. The ink come out in the wash, but I’d still avoid wearing your best clothes. Spread newspaper on the floor. If your cat is curious like mine, she’ll walk through the ink as soon as you open it and track prints over your floor. Place a plain sheet of paper on the floor for the pawprints. Pick up and hold cat gently, as you would to clip nails. Lift paw and place firmly on ink pad. Lift paw and place firmly on paper. Wash cat’s paw in a small bowl of water. Dry cat’s paw with a paper towel. Import scan into Scrapbook Factory. My first Christmas card done, I then got to have fun customizing the inside message for family members, friends, and patients. Some of the cards I’ve mailed, while others Rainy and I will deliver on Christmas Day. Have a Meowy Christmas everyone! 1 Response to "Meowy Christmas!"